Our bodies are growing and changing all the time and our diet is what fuels it. These are fruits that can fuel your body as well as your hair. (There are numerous other fruits as well) Of course hair can seem to be a slow and gradual process. However, as we put good in, we get good out. These fruits and vegetables are packed with vitamins and nutrients that are essential to our bodies. For example, vitamin B-6 in watermelons plays a role in the formation of red blood cells. Red blood cells help give oxygen to our hair follicles. Also, B-6 is one of the components in protein metabolism. Other B-6 rich fruits are grapes pineapple, and pomegranate. I love pomegranate so much lol. Vitamin E is good for oxygen supply too. Vitamin A, that is in Cantaloupes, is good for our immune system, skin, and hair. Vitamin C is great for the immune system as well. Folate rich fruits help tissues grow and cells work. Niacin is good for cellular energy and blood flow. 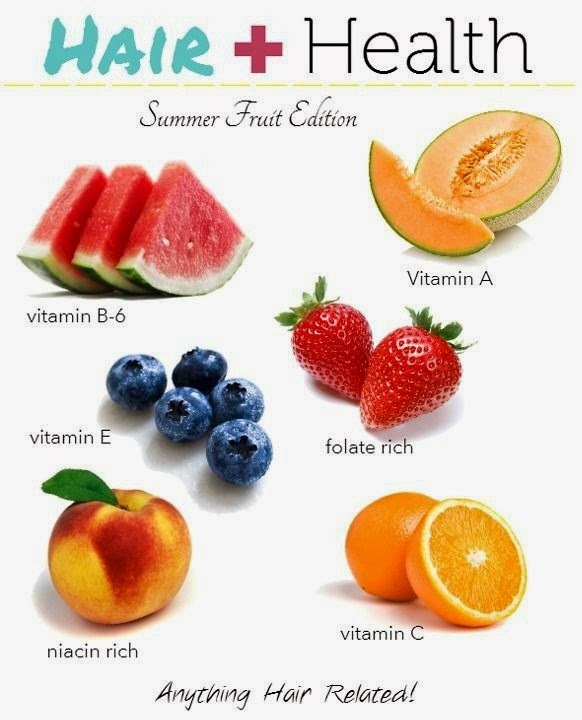 There are many fruits with these vitamins and are packed with other vitamins as well. These fruits are great for smoothies, juicing, fruit popsicles, and everyday snacking. Happy Summer!